Hold onto your hats classic animation fans. It's about to get a little weird and a bit ugly up in here. DC Entertainment has decided to reimagine some of the greatest Saturday Morning Hanna-Barbera cartoon characters of all time. And of course it comes with a twist. But will fans dig it? Or is this sheer blasphemy? We have the photos courtesy of EW for you to decide. You know their names. The Flintstones, Jonny Quest and Scooby-Doo, Where Are You! have been TV staples for the last forty years, and they have amassed a huge fan base, spawning big screen movies and various other merchandise. This May, they will all return in their very own brand-new DC Comics series. The upcoming titles include Scooby Apocalypse, /jonny-quest-movie-live-action-director-robert-rodriguez/Future Quest, Wacky Raceland and The Flintstones. The story lines won't be rehashed from what has come before it, but these will be all new tales told with new takes on each classic character, revitalized for this day and age. Dan DiDio, co-publisher of DC Entertainment, had this to say about the extreme and somewhat shocking makeover. "From a personal standpoint, I was always a fan of the old Hanna-Barbera characters, having grown up on them. I think what you find right now is there's so much material on pop culture, and these characters resonate with so much of our fanbase. It was so fun to go out and look at them, but not just bring back versions that existed 40, 50 years ago and really look at it the way of saying, if these characters were created and interpreted today, how would they exist? So we handed off our materials to a number of top creators, and what came back was an exciting look that felt very true to the existence of the characters." Once the initial ideas for these series were in place, Dan DiDio hunted down just the right creative teams to carry each project forward. He managed to secure some of DC's top talent, including DC co-publisher and veteran artist Jim Lee, Jeff Parker (Aquaman) and Howard Porter (Superman). Once everyone was in place, DC let the creative minds take full rein. Dan DiDio continued, saying this. "What you'll see is that Amanda Connor really looked at the Flintstones and found a way to move them forward, even though they're set in the past. And then we have a great other creators: Doc [Evan "Doc" Shaner, Justice League Darkseid War: Green Lantern] is having a great time with the characters, and we brought in Mark Sexton, one of the designers from Mad Max: Fury Road to take a pass on the Rocky Races." DC Entertainment is quite pleased with what they have accomplished. But out of all these books, there is one that stands above the rest as the 'crown jewel'. And that is Scooby Apocalypse, which has an all-new take on the iconic Scooby-Doo, Where Are You! characters that include Scooby, Shaggy, Velma, Fred and Daphne. Says Jim Lee. "I'm a huge Scooby Doo fan, as I think most people are. I mean, look at these iconic series and they were cultural touchstones for everyone. All my kids know of Scooby Doo from the various cartoons and live action movies, and we're in a period where you have people my age that are spending their days thinking about cartoon and sci-fi action movies. It's a multigenerational obsession at this point, and we just thought it would just be really interesting to take the cartoon version of these characters and see where they would be if we took what existed in the very first iteration of the cartoon and moved it into this day and age." DC Comics hopes to attract some viewers who have never even hard of these characters before. And they don't plan to repeat what has come before it. While Jim Lee teases that the reworked properties could cause 'outrage' he hopes the tide turns in the opposite direction. About what he hopes to achieve with these refurbished comic book titles, he says this. "I hope that they put a smile on people's faces. I think we think of these characters so much as our childhood, and I want people to kind of embrace these updated versions of the characters and really understand that at the core, these concepts are not just limited to little kids." The new comics will be equally suited to both adults and kids. Something that Hanna-Barbera set out to do in the 60s and 70s. In fact, The Flintstones originally aired during prime time as an adult animated sitcom. And that aesthetic will carry through in these new works. About what we can expect to see from the new Jonny Quest, which also launched in Prime Time, DiDio had this to say, along with hinting at what the rest of the catalogue promises to offer fans. "You're gonna have an epic adventure in the future stories with Johnny Quest and Space Ghost. You're going to have a scary, dangerous world in Wacky Raceland that is just as strange and dynamic as you hope it would be. I think Scooby Doo is going to excite people and challenge people, and I think that we're going to use Flintstones to really bring out that voice and social commentary that they might've brought out in the '60s and raise it back for today." The upcoming titles may not be the only ones planned for the future. The Hanna-Barbera library is rich and deep, and may yield many more series to come. And by using the comic book format, there will be a lot of long form storytelling going on that may not have ever been achieved on TV. Mostly, the team behind the upcoming comic book reboots hope that fans love reading them just as much as the artists and writers loved putting them together. You can check out the art here. 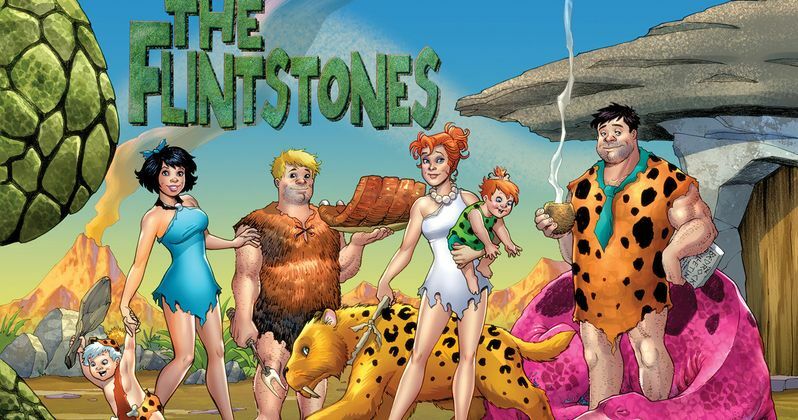 The Flintstones Gets Seth MacFarlane Reboot!